Fine art giclee print of an original watercolor done by Cynthia McDonald. Printed on archive quality paper with state-of-the-art printers using the highest quality Ultra-Chrome pigmented inks and high-resolution software. Finished size is 8 x 10 inches. Image size is 6 x 8 inches with a 2 inch white border. 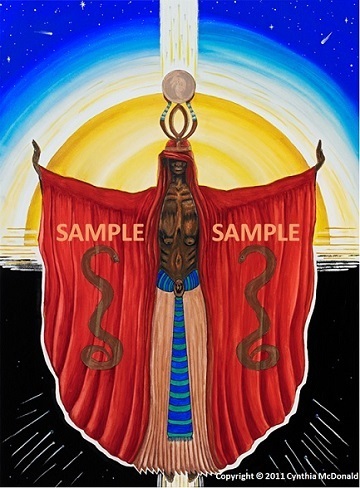 This image emerged from a series of meditations on a particular Kabbalistic path on the Tree of Life (Binah to Tiferet for those of you interested) in which spontaneous images arose from within and demanded to be painted. I was guided internally every step of the way from pencil layout to colors, brushstrokes, and techniques until the image felt complete. Although I put my name on the picture as the artist for pragmatic purposes, in reality, I was simply a paintbrush and pencil in the hand of the Great Artist. The title for the image is from a verse in the Acts of John which is from the Nag Hammadi Library collection of gnostic texts. This image emerged from a series of meditations on a particular liturgical reading from The Gnostic Sanctuary in Redwood City, CA used during the feast of Mary Magdalene. 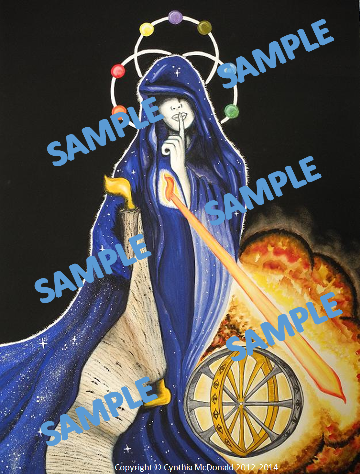 Each purchase also includes a prayer of praise to Shamana - She Who Waits that I wrote to accompany this print. Tarot of the Spirit for Women: Offered Twice in 2019! This full day workshop is designed to provide you with enough teaching and demonstration time to get your relationship with the Tree of Life and the Tarot jump-started. Engage with the Oracle and learn to play the game of life! 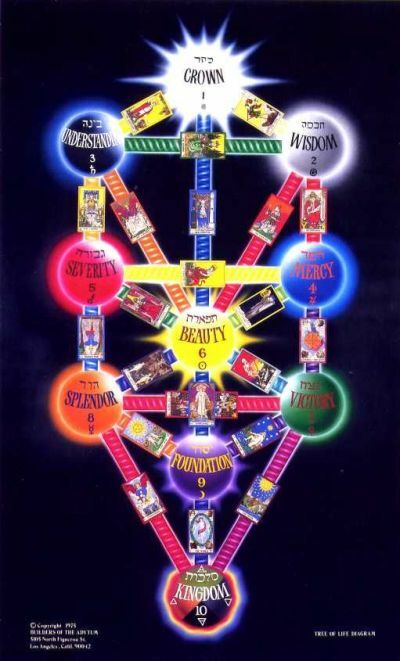 The wisdom of the Kabbalah and the Tarot was traditionally received from “mouth to ear” for those who had “ears to hear it”. This (very) full day is all about catalyzing the ancient mysteries deep within you through the exploration of glyphs, symbols, correlations, ritual, and words. 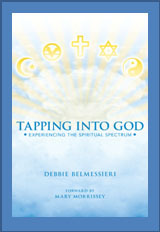 We will do group demonstration readings, meditations, practice readings, and calculate your Soul Card. Come ready to receive, ready to open to the mysteries, and ready to establish a living relationship with the Guides and Guardians of the Tarot! Cynthia has 20 years of experience in the study, meditation, and use of the Hermetic Kabbalah and Tarot. She holds a doctorate in Transpersonal Psychology and has a private practice in clinical and medical hypnosis in San Jose, California. Join us as we dive into the Mystery! Registration: Select "Pay Now" button to the right. Required text: Tarot of the Spirit deck and book. Purchase separately from Amazon or elsewhere. Feeling anxious and stressed in your personal life and with everything going on in the world today? Looking for an affordable tool to help you “take a break” from stress? Mind-body skills are simple techniques scientifically proven to reduce stress and promote feelings of relaxation and well-being. 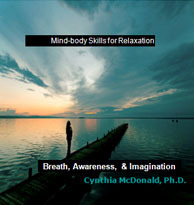 Each of the four skills presented on this CD: mindful breathing, mindful awareness, guided imagery, and loving-kindness meditation, accomplish this differently. An instructional insert in the CD briefly describes each track and offers suggestions for how to use the CD for the best results. The CD is recorded in Dr. McDonald's soothing voice with relaxing music in the background except track 2 which is intentionally recorded with only her hypnotic voice. Each recording is a different length of time ranging from 10-30 minutes so you can easily find the time to use it. Buy it today for yourself or as a gift and make it part of your self-care routine. Sales tax will be added for buyers residing in California. 1. Do I need to have a PayPal account to purchase a product from Transformative Living, LLC? 2. Can I purchase your CDs if I live outside of the United States? 3. Do I pay sales tax? 4. Can I return a CD purchase for a refund if I change my mind? 5. How do I initiate a return? 6. What happens if the CD jewel case arrives damaged? 7. What happens if the CD is defective? 8. What is the shipping policy? 9. When can I expect to receive delivery of the CDs I order? 10. What if I don’t receive my order within the estimated delivery time? Is it lost? No. You can use any of the credit and/or debit cards that are supported by PayPal. Just look for the logo icons of the credit/debit cards when you go to the checkout page to see which cards are accepted. 2. Can I purchase your CDs and Art if I live outside of the United States? Yes. If you have any difficulties processing your purchase, please contact us at info@transformative-living.com and we will do our best to accommodate you. Buyers who live in California will be charged an 8.75% sales tax. The tax will be added to your order at checkout. Any unopened CD (the CD and jewel case are still in the slip cover) can be returned for any reason within 30 days for a refund. Shipping charges paid at the time of purchase are not refundable. Return postage costs are also not refundable unless we made an error, or the item arrived damaged or defective. Please note that if you opened the CD to play it, you cannot return it for a refund. To initiate a return in keeping with these policies, please email us at info@transformative-living.com. Reference your order number in your communication with us, the titles you wish to return, and the reason for returning the product. Once we receive your email, we will send you further instructions. If a CD jewel case arrives damaged, email info@transformative-living.com with your order number within 3 days and we will send you a clear replacement jewel case for free (you will need to remove the inserts from the damaged jewel case and put them into the replacement case). In the case of defective CD, please contact us at info@transformative-living.com within 30 days for information on obtaining a replacement item. A defective or damaged title can only be replaced by the same item. Another title cannot be substituted in place of a damaged or defective item. Standard shipping (First Class Mail) via the US Post Office is the primary shipping method for orders with a quantity of 1-4 CDs. The amount you are charged for shipping depends on the number of CDs on the order. Orders with a quantity greater than 4 will be shipped via US Post Office Priority Mail. A flat shipping rate has been calculated based upon the number of items in your order since the CDs all tend to have the same weight. Confirmation and/or tracking of the order may be included as part of the shipping cost for orders with larger quantities. The chart below details our shipping charges within the United States. This includes the continental 48 states, Alaska, Hawaii, and District of Columbia. Note: shipping for orders with quantities over 10 will be quoted as needed. Standard Flat Rate: Orders with quantity of 1-4 will be sent via US Postal Service. Standard Shipping is the most economical shipping method and typically takes 3-10 business days from the shipping date to arrive. A flat rate has been calculated based upon quantity. Confirmation and/or Tracking: Orders with a quantity of 4 or greater will be sent with confirmation and/or tracking to ensure receipt. The cost of the confirmation/tracking is included in the shipping price for this quantity. Priority Mail: Orders with a quantity 5 or greater must be sent via US Postal Service Priority Mail due to the weight. It will also be shipped with confirmation and tracking. It is estimated that orders will be filled within 2 business days of receipt as long as PayPal approves and completes your transaction within 2 business days. If Standard shipping is used for your order, it is estimated that delivery time will be 4-10 business days. If Priority Mail is used for your order, it is estimated delivery time will be 4-5 business days. Please note that fulfilling your order may take longer if PayPal delays in approving your transaction. In this case, you will receive an email from Transformative Living, LLC letting you know there will be a delay in shipment. For non-trackable shipping methods, our policy is to wait 15 business days before declaring an order lost. If your order has not arrived within 15 business days, please email info@transformative-living.com and be sure to include your order number. Any personal information retained by Transformative Living, LLC to fulfill your order, such as name, address, email, or phone number will only be used for shipping your product and/or communication about your order and will not be shared with any other party. Transformative Living, LLC will never disclose any information it gathers from you that could be used to identify or contact you ("Personal Information"). Any Personal Information provided will be treated in accordance with the terms of this Privacy Statement, unless you are otherwise notified. Transformative Living, LLC will never intentionally disclose any Personal Information about you as an individual. It will never give your name, address, telephone number, credit card number, or e-mail address to anyone without your permission.